May RIF of NOVA News! Everyone MAY Read a Book! Do More 24 is the area's largest 24-hour online fundraiser powered by United Way of the National Capital Area. Donors can contribute to more than 700 participating nonprofits to fund programs and services right here in our own community... INCLUDING RIF OF NOVA! $1 an hour x 24 hours = 12 books for children who truly need the gift of literacy. $2 an hour = even more! Etcetera!!!! So please mark your calendars -- 12:01 a.m. through 11:59 p.m. on Thursday, June 8 -- to give to a cause that truly makes a difference to children's literacy in our area! Yo Ho Ho...to RIF We Will Go! 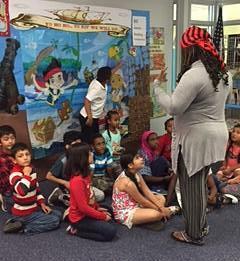 John Adams Elementary School in Alexandria held its RIF of NOVA book distribution with a fun pirate theme. 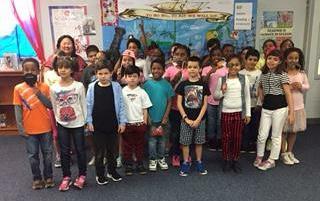 All students participated in a creative writing competition with the topic, "my life as a pirate," and they could dress in a favorite pirate character costume during RIF week. 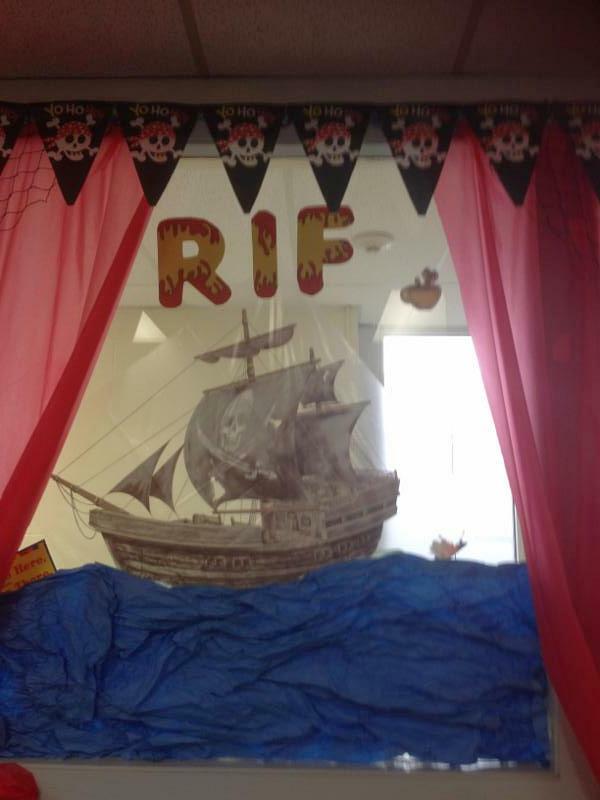 Liaisons Tsion Bezu and Martin Miller went all out with decorations, activities, and creativity to engage their sea-faring readers! Aboard the good ship RIF! Arrgh, matey! Ahoy, sailors! Let's get reading! Here's a happy John Adams pirate group of RIF of NOVA readers! Already off to literary pirate land, er, sea! Each year, the RIF of NOVA board of directors provides a luncheon to celebrate the hard work done by area school liaisons. 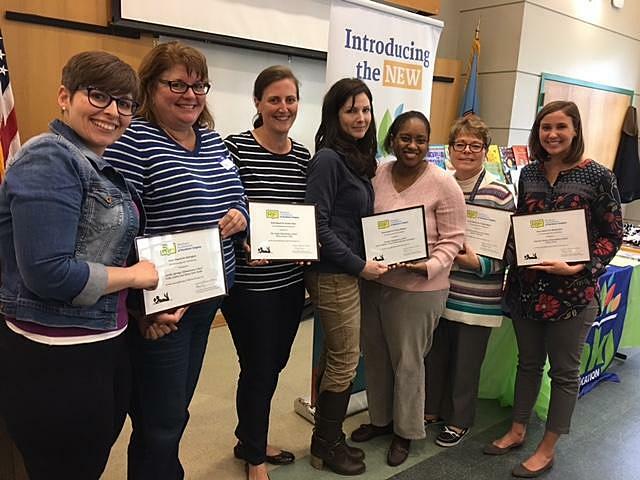 Liaisons -- including teachers, librarians, and reading specialists -- are RIF of NOVA's link to the 24,000+ children we serve in 39 schools and sites throughout Northern Virginia. In addition to lunch, liaisons have the opportunity to meet book vendors and learn about new books available for selection. And...liaisons from each of the five RIF of NOVA regions are honored for "Outstanding RIF Distributions." 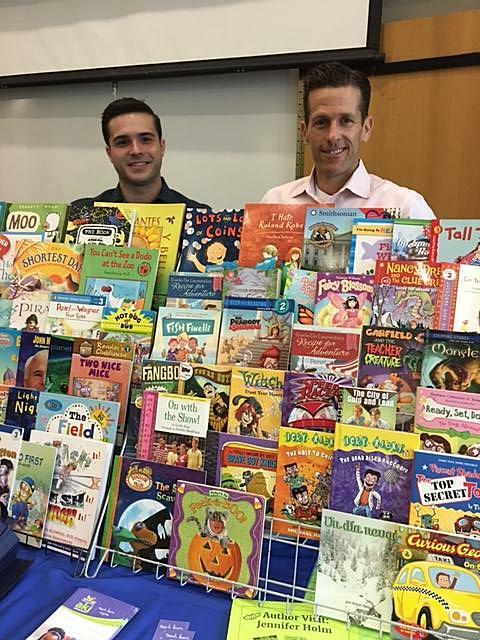 Heartfelt thanks to all liaisons for such wonderful work getting RIF of NOVA books to kids! 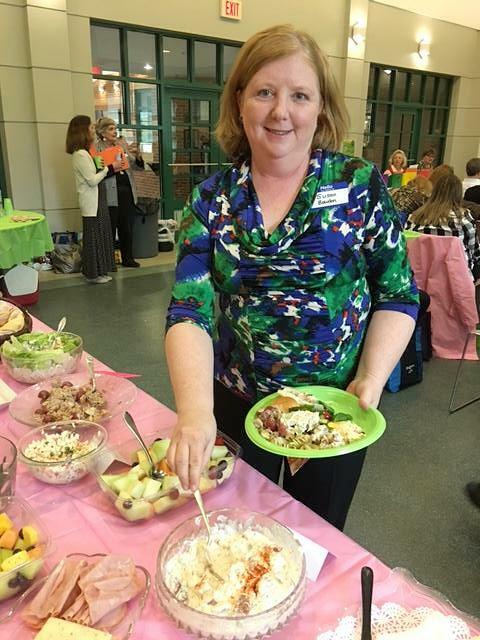 Susan Bowden, West Gate Elementary School in Prince William County, posed in front of the repast! 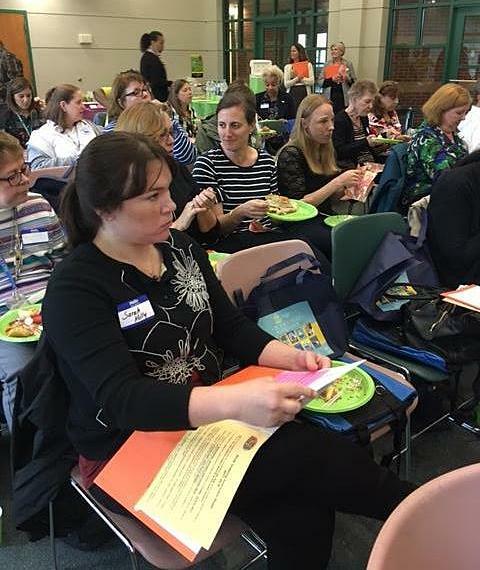 RIF of NOVA liaisons learned about the many book options available for their students! This year's "Outstanding RIF Distribution" honorees -- from left, Mary Clare Moller and Kelly Leahey, Carlin Springs ES; Mary Frances Daly, Mt. Eagle ES; Rachel Wilson, Kelli Williams, and Gina Centamore (not pictured), Sinclair ES; Elaine Maloney, Hutchison ES; and Kelsey Frey, Patrick Henry ES. One of the day's vendors, with a full display of wonderful books, was AKJ Education. Pictured here: Sales Manager Jeremy Brickey (left) and Tim Thompson, CEO. Other vendors included Bookworm Central, Books4School, and Scholastic. Thanks to our loyal vendor reps for the ongoing support for our RIF of NOVA kids! A number of area summer reading programs kick off in late May and early June. The Alexandria Library's 2017 Summer Reading Program is called: Build a Better World. Anyone who is able to check out items from the Alexandria-Monroe Public Library, for example, can participate in this program, which starts on Saturday, May 27 and runs through Saturday, July 15. A block party kicks off the event on Saturday, June 3 from 11:00 a.m. until 2:00 p.m. Learn more here: http://www.alexlibrary.net/summer-reading-2017/#Q1. More summer programs will be listed in the next RIF RAP. And please check your local library for programs near you! Let's fight the summer reading slide with books, books, books! 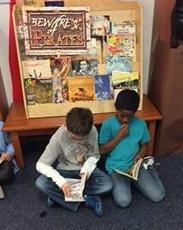 Do you know a child interested in comic books, science fiction, and fantasy? If so, the Library Comic Con is the place to be! The event features Gene Luen Yang, co-author of the Secret Coders and The Shadow Hero, along with workshops, artists, vendors, prizes, and books available for sale and signing. The event is co-sponsored by the Friends of the Chantilly Regional Library. Learn more here. Martin Luther King Jr. and Malcolm X are familiar names in the history of America’s Civil Rights Movement. But what about Joan Trumpauer Mullholland? 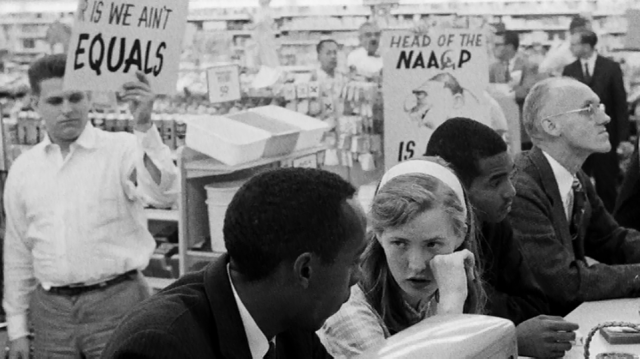 Mulholland, pictured here at a lunch counter sit-in, became active in non-violent campaigns for racial equality in Mississippi in the early 1960s. She has been written about in several books, including “Coming of Age in Mississippi,” “Breach of Peace,” and “We Shall Not Be Moved.” Meet Joan Trumpauer Mullholland and hear her story! 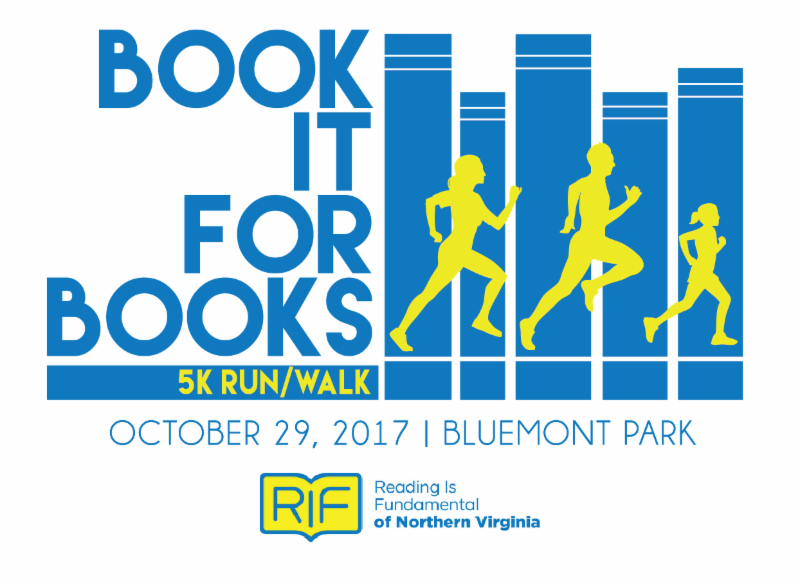 Date: Sunday, May 21, 12:30 p.m.
Join RIF of NOVA on Sunday, October 29 at Bluemont Park in Arlington, VA for our second Book It For Books 5K/One-Mile Fun Run! The race will take place just before Halloween, so children (and parents) are encouraged to wear costumes — especially if the costume represents a beloved book character! RIF of NOVA schools are invited to send teams of children, liaisons, teachers, staff, parents, siblings, neighbors, friends, and more to run or walk the race. The team with the highest number of participants will be honored in a very special way. Details will be added throughout the summer on the RIF of NOVA website so please check back often at www.rifnova.org! We will be looking for sponsors for the race throughout the summer, so if you know an individual or business potentially interested in sponsoring our race, please email us at: rifnova@gmail.org. Editor's note: Hutchison Elementary School's location was incorrectly identified in the April RIF RAP as South Riding. That, of course, is not correct! Hutchison is located in Herndon. Please give the gift of literacy to a child who lives right nearby! How?